Please join us for a special program about the bonds between mothers and their children—in advance of Mother’s Day. Live on iCRV radio, “Library Chat” program. Here’s the tape of our rollicking radio interview! CLICK HERE for the link, then the  . 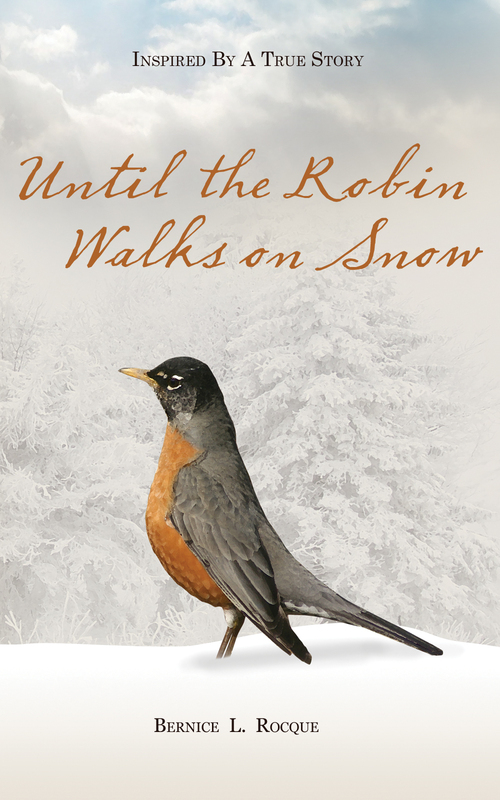 My first book, UNTIL the ROBIN WALKS on SNOW will be one of our discussion subjects when Gwen Pond interviews Wendy Connal, Director of the Bill Memorial Library (in Groton) and me about holiday themes, and YA books / services. Tune in for our conversation AND learn about the very fascinating connections between Wendy, Gwen, and I, only discovered in recent years. Once the station posts the recording, I’ll provide a link for listening. The author will discuss her French-Canadian mother’s story from her newest book, The Ponemah Years: Walking in the Footsteps of My Mother. The author’s mother was a weaver at the Ponemah Mill in Taftville, CT and her maternal great-grandfather Louis Duhamel worked in the Slatersville Mill, near Woonsocket, RI. Ms. Rocque will talk about why she is writing stories about her family, she’ll reflect on what she has learned so far in writing creatively about her family’s “characters” via fiction and nonfiction, and she’ll share tips for pulling together stories based on family history. Both The Ponemah Years… and her first book, UNTIL the ROBIN WALKS on SNOW, published in 2012, will be available for purchase and signing. “Robin,” also based on her family’s history, is the Christmastime survival story about the determination of the midwife and her Lithuanian / Polish grandparents to save their 1.5 LB newborn in 1922. Click here for the AFGS website. Journey back nearly 100 years to the mill village of Taftville, CT, an enclave of French-Canadian immigrants. The Picard family arrived in 1924, seeking the security and fair wages of the great Ponemah Mill. 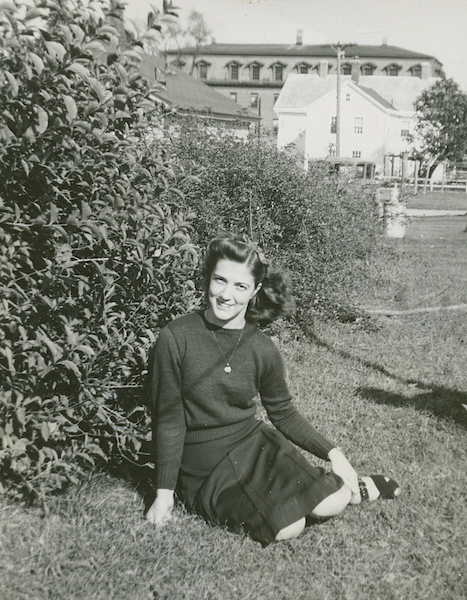 Ten family members would work there, including Gabrielle, who became a weaver in the 1940s. This is her story, as well a daughter’s journey to know her better. Parts biography, history, memoir, and family portrait, this book features 184 images from more than ten decades. Author Bernice L. Rocque, a Norwich, CT native and family historian, will read from and discuss her new book, The Ponemah Years: Walking in the Footsteps of My Mother. She’ll also share what she has learned so far in portraying the “characters” from her family’s history, via fiction and nonfiction. Her first book, Until the Robin Walks on Snow, an award-winning novella was published in 2012. This work of fiction, followed by a section of Author’s Notes, recounts the 1922 birth of the author’s uncle, 1.5 LB preemie, and the determination of her family and the midwife to save this fragile newborn, in a time before neonatal technology. Copies of both books will be available for purchase and signing. connected with my new book, The Ponemah Years…. Here is a cover glimpse and description of the book. Gabrielle Picard remembered the “long train ride” from Quebec to Connecticut in 1924. She was four years old when her family of fourteen emigrated to Taftville, the location of the famous Ponemah Mill—known for its steady work, fair wages, and good housing. The Ponemah years would be etched by loss, but also brim with hope, hard work, and heroes. This is Gabrielle’s story of becoming a weaver in the 1940s, and her daughter’s journey to know her better. In a narrative of interwoven biography, history, memoir, and family portrait, the story unfolds with 184 images from more than 10 decades. Gwen Pond will interview Three Rivers Community College (TRCC) Librarian Laura Vasselle and me in advance of an event next week in Norwich, CT about the great Ponemah Mill. We’ll also discuss my new book, The Ponemah Years: Walking in the Footsteps of My Mother. Click here for the link to the recording of the April 5 iCRV radio interview. My segment begins about 5 minutes into the program. 574 New London Tpke, Norwich, CT.
— Artist/Photographer Jody Dole will talk about his mural and the creative process. 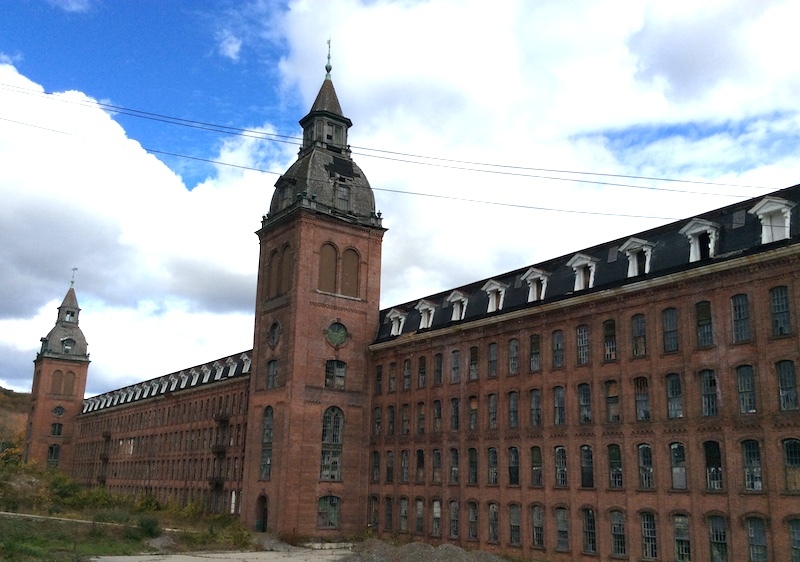 — The Norwich Historical Society will show a new documentary film about the Ponemah Mill and Taftville. Fire Chief Time Jencks will narrate. — Guest Bernice L. Rocque, Norwich native and author, will converse with attendees and sign her recent book, The Ponemah Years: Walking in the Footsteps of My Mother, while we enjoy cookies and tea. 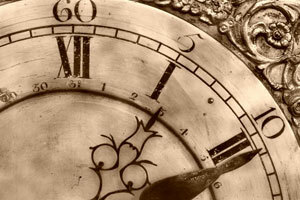 12:00 NOON – 1:30 pm. Otis Library will host a special “Lunch and Learn” in honor of Mother’s Day on Thursday, May 10, at 12pm in the Millie and Martin Shapiro Community Room. 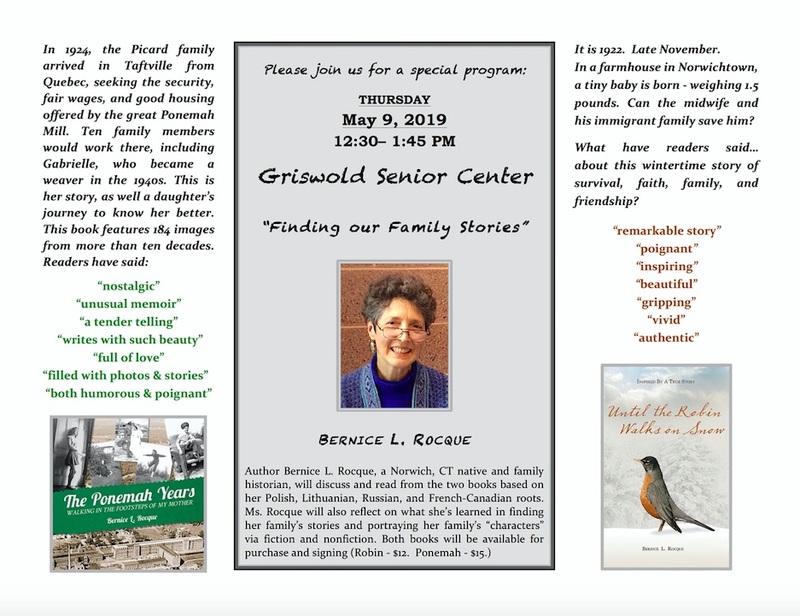 Norwich native Bernice (Janovicz) Rocque will discuss her new book, The Ponemah Years: Walking in the Footsteps of My Mother. Ms. Rocque will share insights gained during her research/writing and will invite participants to share memories of their own mothers. 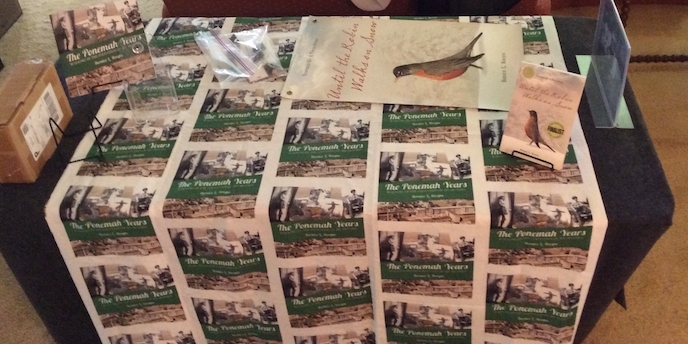 Gabrielle Picard, the author’s mother, wove fabric at Ponemah Mill and resided in Taftville, “the village,” from 1924-1946. Copies of the book will be available for sale and signing. This is a free event; lunch is included. Registration is required. To register, call Julie at (860) 889-2365, ext. 128, or register on the online calendar. Networking at 6:30 pm, Speaker at 7:00 pm. 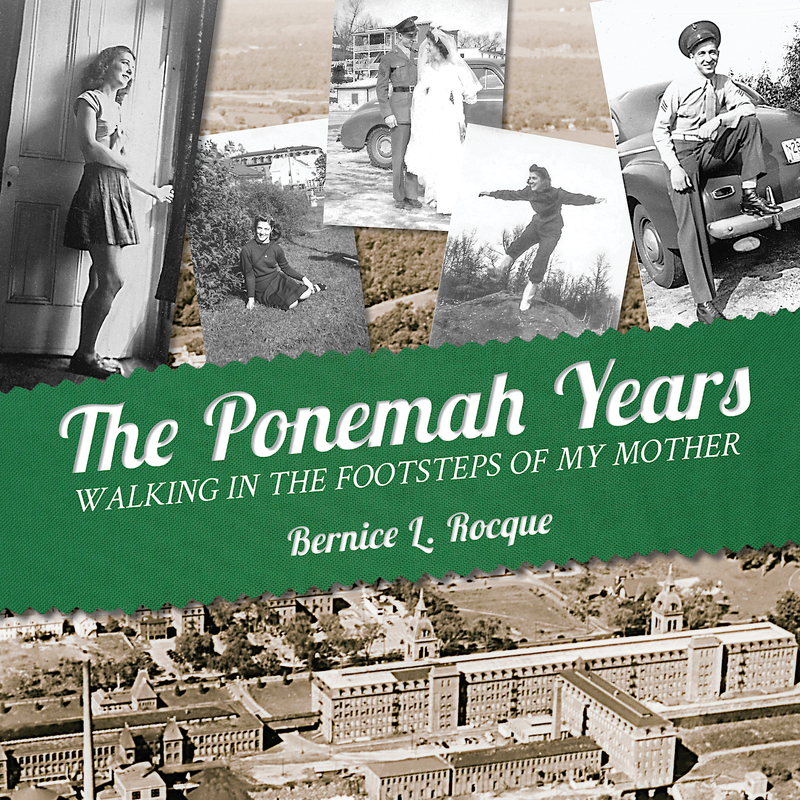 During an interactive program with “show-and-tell” samples, Bernice L. Rocque will discuss the decisions and challenges she experienced during her recent book project: The Ponemah Years: Walking in the Footsteps of My Mother. The subject book is an 8.5″ x 8.5″ format nonfiction book: with a narrative weave of biography, history, memoir, and family portrait. It features 184 images from more than 10 decades. 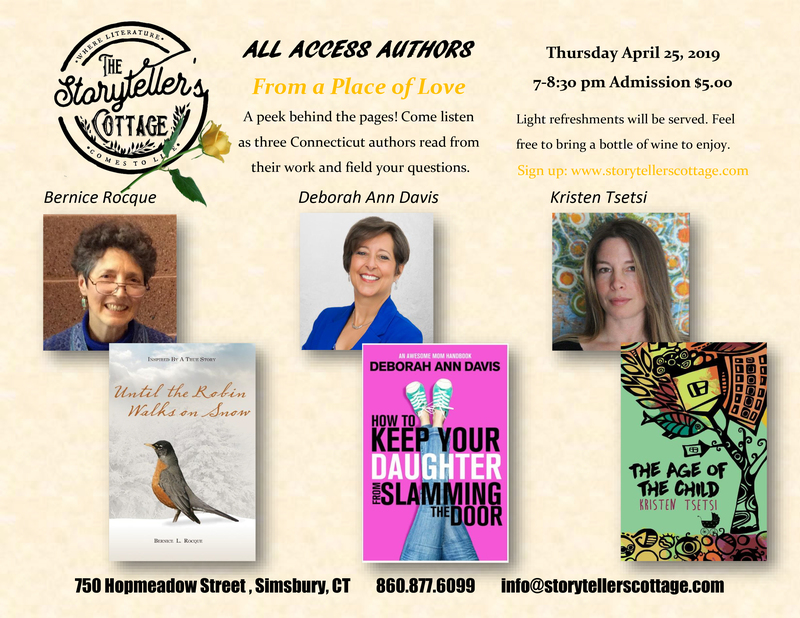 Book lovers and readers: What a great opportunity to connect with more than 40 Connecticut authors! They will be selling and signing their books — a super chance to treat yourself and the special people on your holiday gift list. Stroll from table to table, chatting face-to-face with authors representing many reading genres, including Bernice L. Rocque, Author of UNTIL the ROBIN WALKS on SNOW. She grew up in Norwich, Connecticut in the surroundings where her story is set. The award-winning book is historical fiction, based on a critical event in Ms. Rocque’s family history. In 1922, her grandparents, their family, and friends were determined to save a 1.5 LB newborn, despite survival odds of less than 1 percent (of babies of that size nearly 100 years ago). This novella length story, suitable for ages 10 and up, includes an appendix of Author’s Notes which offers facts, family history, and research information about the story. Reader reviews have often mentioned appreciation for the further specifics contained here about the medical, geographical, genealogical, and weather elements of the story. THE RECORDING is now available! CLICK HERE for the link. Barry Eva will interview me about UNTIL the ROBIN WALKS on SNOW. Please join us for a cozy half hour interview over the net… via your computer. To listen to the LIVE interview, just press the arrow on the chat box that appears… after you CLICK HERE. If you miss the live interview, check back here and I will post a link for the recorded interview after it occurs. A Book and a Chat” has proved a hugely popular radio program with people of all ages. With nearly 1000 shows already recorded, the shows format of “a chat over a cup of tea” has received nothing but rave reviews from guest and … listeners alike. The writer of a successful young adult romance book “Across the Pond” Barry has himself appeared on a large number of radio and TV programs. You can listen to the radio show live AT THIS LINK . Press arrow on chat box to listen. Or to catch up on interviews in the archives, CLICK HERE . Read what the guests are saying about the show: CLICK HERE . FOUR days of memories and fun! Join the celebration as Taftville, the village of the famous Ponemah Mill turns 150. Carnival midway, Food, Arts & Crafts vendors, Parade, Dunk Tank, Community nightly dinners, Stage Entertainment, and much more. Click here for the Event page on Facebook. Hope to see you! My presentation subject is how I applied project management techniques to the writing and publishing of my first book, UNTIL the ROBIN WALKS on SNOW, and how I am setting up for the second book, with the addition of some lessons learned. Click here for the meeting announcement and registration information. Hope to see you! With a special appearance by Novelist Wally Lamb !!! More than 15 authors whose roots are in Norwich, CT will participate in the NFA Book Expo to be held SATURDAY, OCTOBER 11, 2014. There will be books to interest just about everyone: nonfiction, children’s books, contemporary fiction, historical fiction, science fiction, local history, and dark fantasy. 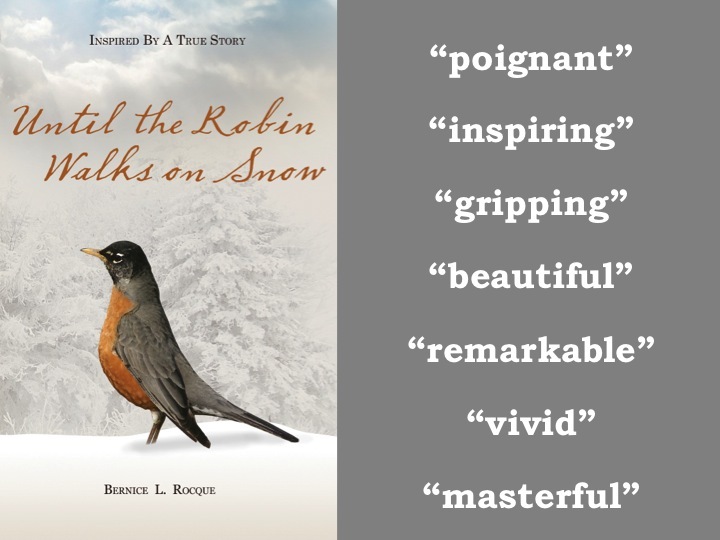 Bernice L. Rocque, a Norwich native and author of UNTIL the ROBIN WALKS on SNOW, will be one of the authors featured. 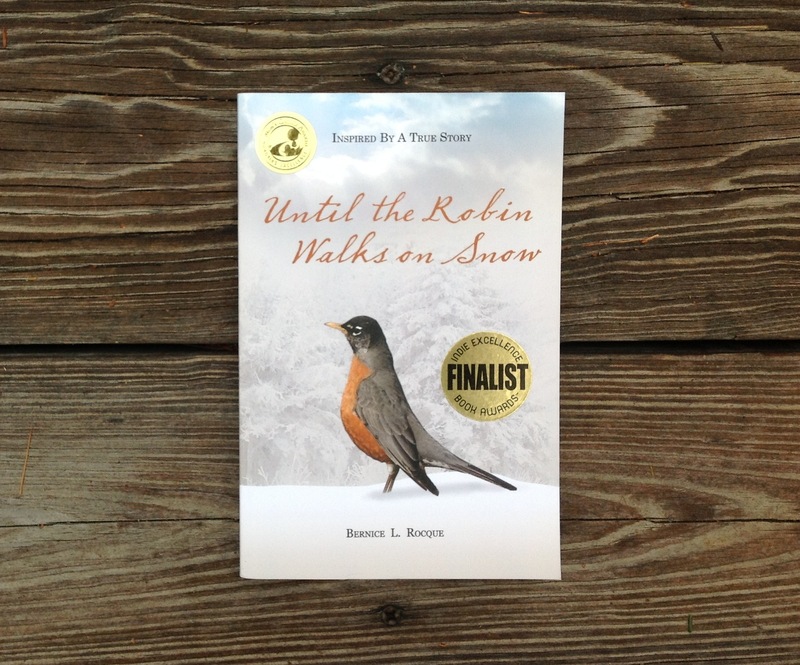 Bernice L. Rocque’s novella, UNTIL the ROBIN WALKS on SNOW, inspired by a true event, is based on her immigrant family’s determination to save her uncle, who weighed just 1.5 pounds at his birth in 1922. The book includes a chapter about the family’s Lithuanian and Polish Christmas traditions, as well as Author’s Notes which provide additional background on the medical, historical, and genealogical aspects of the story. In 2013, UNTIL the ROBIN WALKS on SNOW was honored with the Mom’s Choice Gold Award for YA Historical Fiction, as well as being named a Finalist in the Faction (fiction based on fact) category of the National Indie Excellence Award. Bernice is an NFA classmate of Novelist Wally Lamb, the headliner of this Book Expo. 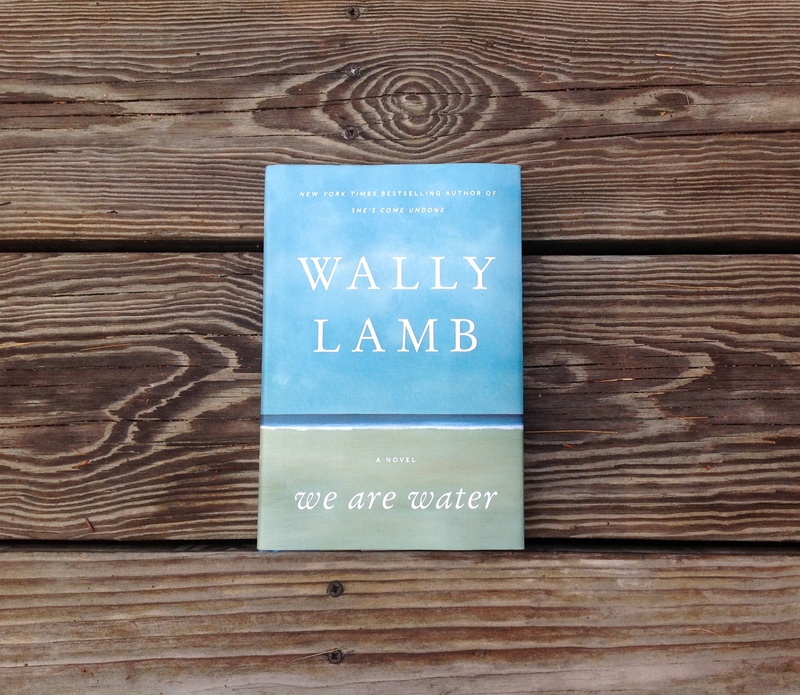 Wally’s latest novel is the wonderful WE ARE WATER. In advance of the Book Expo, Wally will lead a Walktober Event called “Wally Lamb’s Norwich.” Call 860-887-6964 for more info about the 1:30 pm walk, which will stroll by his childhood home and take in some scene locations in his books. Via the walk and the book expo, Wally’s fans may learn more about the movie release of his nostalgic Christmas novel, Wishin’ and Hopin’. Many scenes were shot at NFA, in Norwich, and in other eastern CT locations. Here is a recent article about the filming this past summer. The theatrical premiere is scheduled for November 23 at the Garde Arts Center in New London, CT. For tickets and further information, call 860-444-7373. Here is the full list of authors currently scheduled to appear at the NFA Book Expo on Saturday, October 11, 2014. So do take the opportunity to meet and chat with these authors in person. They all have a special connection to Norwich. It will be a good opportunity to pick up some great reading for yourself or those on your holiday list! I understand light refreshments will be served, too. Ever been to the Garlic Festival in Mystic, CT? Attendees love it, so I will be there this Saturday, September 20, at the Olde Mistick Village, right off I-95 at exit 90. If you decide to go, please stop by and say hello. I’ll be at booth #38 near the church bldg and not far from Franklin’s General Store, one of the fabulous shops in this beautiful walking complex. 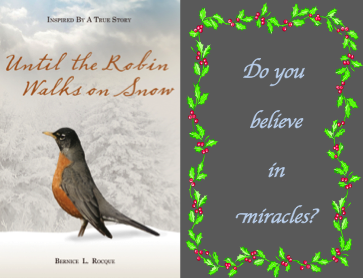 I’ll be chatting with readers and signing my book, UNTIL the ROBIN WALKS on SNOW. 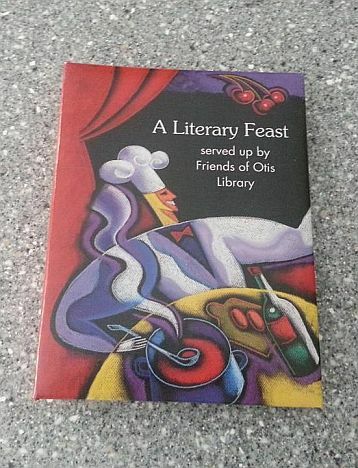 The fabulous fundraising cookbook, A LITERARY FEAST, will be available for purchase at my booth, as well as the captivating children’s books by Frances Gilbert, including TODAY the TEACHER CHANGED OUR SEATS, honored recently as a Finalist in the CLIPPA Awards. By the way, the cookbook’s 3-ring binder format includes 500 recipes of the Friends, library staff, community members, authors, and chefs. Autographed copies of UNTIL the ROBIN WALKS on SNOW will be available at the Otis Library Friends booth. It is not too early to think about holiday gifts! 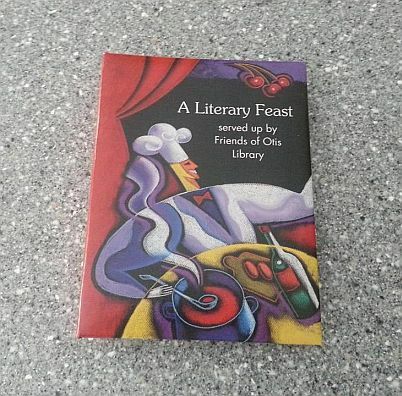 The Friends will be selling their fabulous fundraising cookbook, A LITERARY FEAST. The cookbook’s 3-ring binder format includes 500 recipes of the Friends, library staff, community members, authors, and chefs. Bernice L. Rocque, Author of UNTIL the ROBIN WALKS on SNOW, will make her granola recipe on behalf of the FRIENDS of the OTIS LIBRARY. The show will air JULY 9, 2014 mid-day on the Connecticut Style program of WTNH-TV in New Haven. The Friends recently published a new fundraising cookbook, A Literary Feast. The cookbook includes 500 great recipes from the community, twenty authors, and numerous area chefs. Backus Hospital Gift Shop, Chelsea Groton Bank, Forever Flowers and Gifts, Hart’s Greenhouse, Johnson’s Flowers and Gifts, McKenna’s Flower Shop, Lisbon Town Clerk’s Office, Norwich Senior Center, Otis Library, The Pantry, Small Potatoes, Sprague Historical Society, Tulli’s Family Pizza, Utley Jones Pharmacy, and Waitte’s Insurance Agency. Adriana Trigiani, and Susan Wiggs. Barbara Bergman, Barbara Cambria, Denise Dembinski, Pepi Kahn, Carol Lahan, Jeanne May, Cynthia Strouse, Jennifer Tyler. Several local writers, including Bernice L. Rocque, Author of UNTIL the ROBIN WALKS on SNOW, will read from their work at the Trumbull Public Library’s WRITERS READ. Please join us at 6:30-8:30 pm on MAY 1, 2014 in the Community Room.